Looking back at the first week of baseball, the Rays have to be satisfied with where they stand. They’ve had a very good start to the season, going 4-2 including a sweep of their division rivals the New York Yankees. It’s nice to see a good start to the Rays’ season this year, after a horrendous start in 2011 when the Rays lost all of their first six games. What’s most impressive about the Rays’ first week is that they’ve been able to beat strong teams, despite having numerous injuries. B.J. Upton has been on the DL since the season began, while Luke Scott has missed the whole Detroit series with a hamstring issue. The Rays have also been without their closer Kyle Farnsworth, who’s on the DL as well. Even with three key injuries, the Rays have proven they can contend. The Rays picked up Luke Scott and Carlos Pena this winter to replace Johnny Damon and Casey Kotchman, and so far it’s paying dividends. Although Scott is now hurt, both sluggers have had great starts to the 2012 season and have made immediate impacts in the lineup. Fernando Rodney has also proven to be a smart addition to the roster, as he has excelled so far in the closer role for the Rays. Jose Molina hasn’t exactly got it going with the bat yet—although he is starting to hit a little better—but still bolsters the Rays’ defense behind the plate. Jeff Keppinger is one more offseason acquisition that has paid off, as he’s had some big hits during Opening Week. The Rays’ offense has probably been the biggest surprise so far this season. It’s still very early, but the Rays have hit pretty well considering the key injuries in their lineup. The meat of the order has got the job done, producing most of the team’s runs thus far. Evan Longoria is red hot with the bat, putting up a line of .476/.577/.762 with a home run and four RBI. Carlos Pena is on fire as well, leading the team in RBI and homers (8 RBI and 3 HR) while hitting .429/.556/.905. Matt Joyce has also knocked in four runs himself. Luke Scott—who only played three out of the six games—is 3-6 with three RBI to start the season. Scott has proven that he’s an impact player in the middle of the lineup, which is why the Rays need him back as soon as possible. With the addition of Luke Scott and Carlos Pena, who have both had great starts to the season, the Rays offense is more potent than it was in 2011. With the return of B.J. 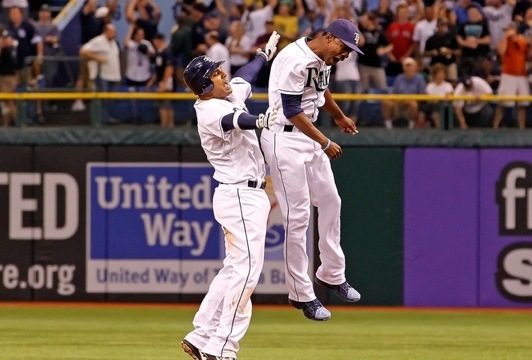 Upton in the lineup, the Rays could be a serious contender to win the AL East. Still, there are some clear weaknesses in the lineup, mainly the bottom of the order. Both Sean Rodriguez and Reid Brignac are not getting the job done offensively at the shortstop position. 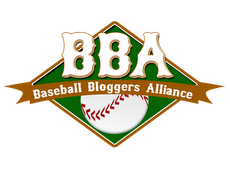 Rodriguez has hit .067/.176./.067 without an RBI to start the season, while Brignac has hit.100/.182/.100 without an RBI as well. Elliot Johnson—who backs up both of them at short—hasn’t had a good start either. Fernando Rodney has been absolutely perfect in his 2.2 innings pitched so far this season. With Kyle Farnsworth out with an injury, Rodney has stepped up with three saves without allowing a baserunner yet this season. Rodney has exceeded expectations, and has already established himself as the team’s closer during Farnsworth’s stay on DL. It’s a question how effective Farnsworth will be when he returns, as he’s been experiencing elbow soreness since last season. I would be surprised to see him immediately jump back into the closer role whenever he returns to the ‘pen, which is why I think Rodney will be the team’s true closer this year. The Rays have been able to win with big injuries, but it will be hard to win in October with all the tough American League competition. As I said before, the Rays need both Luke Scott and B.J. Upton healthy in their lineup, and a healthy Kyle Farnsworth would also be a big help to the bullpen. On the positive side of things, Scott could return to the lineup at some point during the Rays’ weekend series at Fenway, while Upton should return to the lineup around April 20th. Unfortunately, Upton, Scott and Farnsworth are not the only hurt players on the roster. Sam Fuld will miss most of the season with a wrist injury, and backup catcher Jose Lobaton is now dealing with shoulder soreness. Hopefully, these are just some early-season woes, but a handful of injuries after just one week of baseball is starting to become a pain for the Rays. Just saw the Whitecaps take on the Bowling Green Hot Rods this week (Rays low-A, Midwest League). They have a great infielder Ryan Brett, who had great range and should be a good prospect for the Rays if he can hit. Nice, I’ve been following the Hot Rods this season, and Brett is having a great start to the season. I think he has a promising at second base I believe, and is a perfect fit for the Rays with his constant hustle play. I wrote a scouting report on him a while ago in my Rays Top Prospects 2012 (Part 4) article. RobinI remember my first and only opnneig day for the Cubs. It was freezing and the guys in front of us were drunk, without shirts and turning purple. Oh the memories. What a sky! Lovely shot!I can’t quite discern that the road is there but snieeg the electric lines makes me feel like I’m heading down a road to the comfort of home at the end of a long day. That\’s not just the best answer. It\’s the bestest answer! Have the Rays Been Too Hesitant to Trade a Starter?